Flying gear - Left: 10 litre Jerry can of unleaded petrol, oil for fuel mix, funnel, telescopic wind indicator, tool and repair kit with a few spare parts, spare two part propeller, 26 metre square paraglider wing in a the red bag. 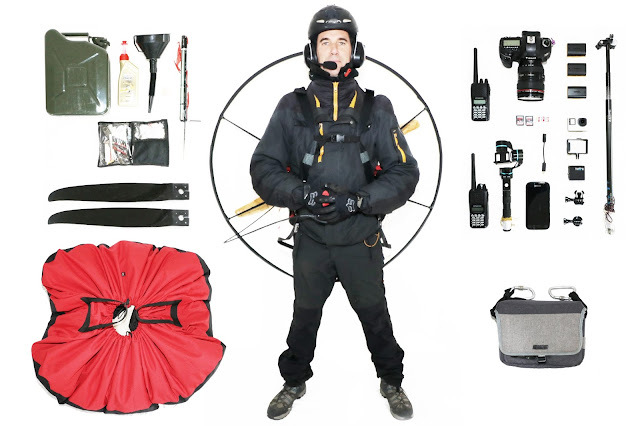 Center: On my back a Miniplane TOP 80 paramotor 2 stroke 80cc engine with wooden propeller, wind proof clothing, strong shoes, gloves, helmet with integrated microphone, VHF two way radio, altimeter, watch, knife, flying insurance documents, flying licence, machine and wing ID. Camera gear- Right: Canon 5d mark3 with a 24-105mm lens, memory cards, batteries, gopro with different accessories, gimbal for gopro stabilisation, telescopic pole for gopro, telephone and camera bag. Depending on the outside air temperature I wear more or less clothing. The more you gain altitudethe colder it gets. When you add up the petrol (7 to 12kg) , the camera gear, the clothing and helmet that makes quite a lot of extra take off weight.